Chasing a cumulus cloud on a trail run in El Escorpion Park. The rock and brush-choked gully was going to have to do. There was no “use trail” or other path that I could find. 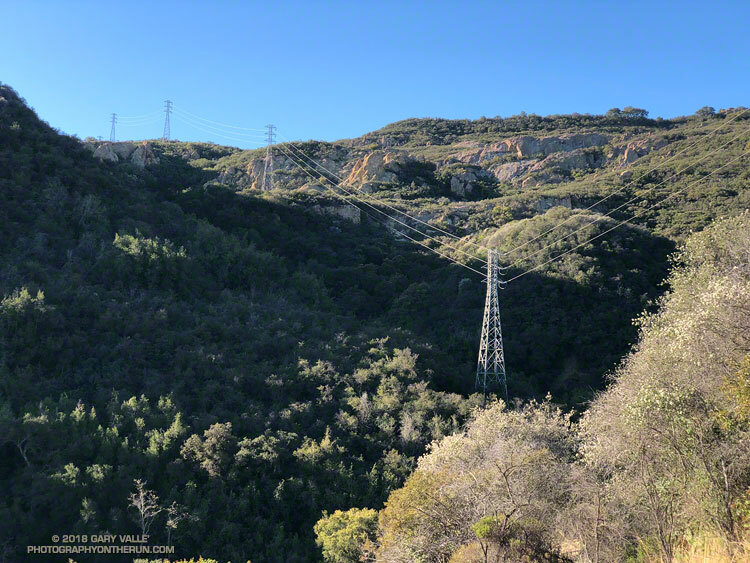 Just to be sure I wasn’t missing another route, I followed the overgrown dirt road past the power transmission tower to where it dead-ended at a wall of chaparral. Returning to the gully, I looked up. A large boulder and some other debris were wedged against a tree, blocking its entrance. Knowing well the pitfalls, I carefully clambered over the aggregation and started up the congested channel. Curiosity is an irresistible force for most that love the outdoors. It propels us to explore near and far, experiencing what we have not experienced before. It knows no geographic bounds, and can be equally strong a mile, or a hemisphere, from home. In a sense this adventure began years ago, when I first noticed the power line service roads paralleling the Bulldog Mtwy fire road. Since then I’ve done the Bulldog loop many times. Each time I’ve looked over at those roads and wondered why they didn’t connect — and how difficult it would be to link the two. That question might finally be answered today. The plan was to do a variation of the Bulldog Loop, finishing the climb to the crest using the power line service roads, rather than Bulldog Mtwy. When I’d parked at the the Cistern trailhead on Mulholland the temperature had been a chilly 28 degF. A mile and a half into the run, down in the canyon along Malibu Creek, the Tempe sensor attached to my pack read 24 degF! It was cold enough that the wind chill from running 4-5 mph was significant. I could feel the cold through my gloves and arm sleeves and my hands were getting cold. I flexed my hands as I ran, and from time to time would briefly walk to reduce the chill. Relief was only a couple of miles away — at the start of the Bulldog climb I would break into the sun. Ah sun, glorious sun! There is nothing quite like the warmth of the morning sun following a cold dawn. It warms the body and imbibes the soul. It is something to relish and celebrate. I’d reached that sun about 30 minutes ago. Now I was immersed in cool shade and working my way up the steep drainage through thick chaparral. The puzzle was not an easy one, and I’d almost turned around several times. To not make a foolish decision, it is necessary to be willing to turn around. At one point the route up the gully appeared to be blocked. Looking for an alternative, I worked up a steep slope on the left, concentrating on the route-finding. It wasn’t going to go either. When I stopped to re-evaluate the route, I realized I was surrounded by a tangled thicket of just-sprouted poison oak. Resigned that it was just going to be too ugly to continue, I returned to the gully, intending to follow it down. But then I muttered to myself, “I wonder…” and took a couple steps up the gully, and then a couple more. A route through the impasse revealed itself. Many times that’s all it takes — a step or two — to see a solution not seen before. I could continue. Eventually the terrain forced me to the right of the gully, up along a sandstone rib, and toward a little outcrop. The rock quality was very poor. Fist-sized pieces of cobble embedded in the sandstone could be pulled out by hand and sound-appearing holds were easily broken. With some careful route-finding I was soon on top of the sunlit rock. An island in a tumultuous ocean of chaparral, it gave me the first good view of my surroundings since I’d started up the gully. From the outcrop I could see why the roads didn’t connect. Partially hidden from view, a 50′ tall headwall completely blocked the drainage. There was no way I was going to try and climb the headwall directly. Trying to force a line here would be a very bad idea. But there was a weakness on its right side that — if it wasn’t too steep and loose — might go. And it did! Once on top of the headwall, only a bit of bush-whacking was necessary to get to the first tower on the upper service road. Freed from the tangle of chaparral, it didn’t take long to get up to Castro Peak Mtwy, and back onto the Bulldog loop. I won’t be doing THAT route again, but did enjoy solving the puzzle — even if it was a bit bizarre. Here are a few photos taken along the way. Once again Southern California is facing another very dry rain year. Since July 1, Downtown Los Angeles (USC) has recorded only 1.97 inches of rain. This is more than 8.5 inches below normal. At this point it appears likely the rainfall recorded at Los Angeles from July 1 – February 28 will be the second driest for that period on record. If we don’t see some significant rain in March, we could be contending with 2006-2007 for the driest rain year on record. Several weather models have been advertising a change to a wetter weather pattern for the West Coast and Southern California. At one point the ECMWF was forecasting several inches of rain in the Los Angeles area around March 1-2. This morning’s ECMWF run was far more stingy with the wet stuff, and precipitation completely disappeared from the GFS forecast for that period. Never fear, these forecasts will likely change again. Model skill more than a few days out is very poor. Next week we should have a better idea if the pattern change is real, or just more model hype. Update March 1, 2018. With only 1.99 inch of rain from July 1 to February 28, Downtown Los Angeles (USC) did end February with the second driest rain year to date. Depending on whether 1911-1912 is included in the ranking, the water year to-date, beginning October 1, is either the second or third most dry on record. Now all eyes turn to the storm that is forecast to move into the Los Angeles area this evening. This morning the CNRFC 72 hr. QPF for the Los Angeles area ranges from around 0.75 – 1.0 inch in the basin and valleys to around 1.5 – 1.75 inches in the mountains. Higher totals are forecast in the Ventura and Santa Barbara areas. Check with the NWS Forecast Office Los Angeles for the latest weather forecasts, advisories and warnings. Nope, I wasn’t running near Las Vegas or north of Mojave, this Red Rock Canyon is in Old Topanga Canyon, southeast of Calabasas Peak. 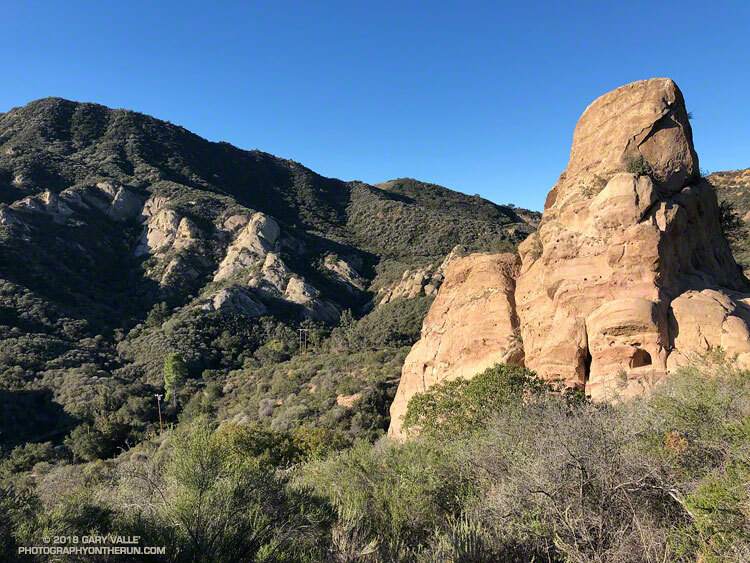 Although there’s a trailhead off of Old Topanga Canyon Road, I usually access Red Rock Canyon from the top, using Calabasas Peak Mtwy and Red Rock Road. 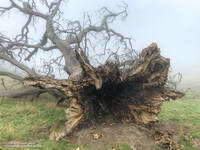 The valley oak pictured above — one of the larger oaks along Rocky Peak fire road — toppled over in the summer of 2016 following five years of drought. Fire and drought are a natural part of the valley oak’s habitat and the trees have evolved to withstand ordinary variations in their environment. However, severe fires or extended droughts, or fire in combination with drought can overcome the tree’s defenses. The drought may have been the culminating factor in the felling of this oak, but fire and other factors may have also played a role. Base of large valley oak that toppled following five years of drought. Click for larger image. According to the Fire Effects Information System (FEIS), the heart-rot fungus Armillaria mellea is usually present in valley oaks and larger oaks tend to be hollow or rotten in the center. The toppled oak was hollow near its base and its interior appears to have been blackened by fire. The FEIS describes instances where the decaying wood in the interior of older valley oaks could ignite in a fire, but leave the exterior bark uncharred. What fire might have burned the tree? There are two possibilities: the 2008 Sesnon Fire and the 2003 Simi Fire. It probably wasn’t the Sesnon Fire — this photo of the tree, taken about a month after the Sesnon fire, shows little impact. 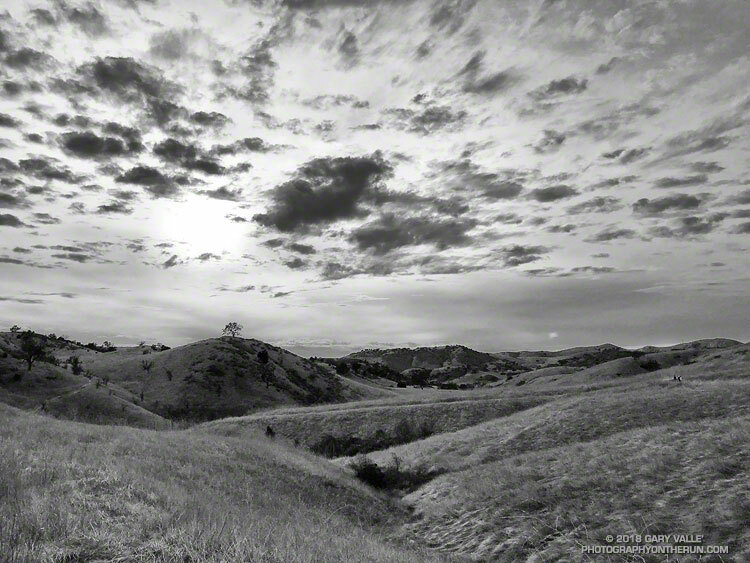 I couldn’t find a photo of the tree following the Simi Fire, but photos taken nearby show a severely burned landscape. Ultimately, it appears fire and drought weakened the tree, accelerating its heart rot and weakening its roots to the point it could no longer support itself. 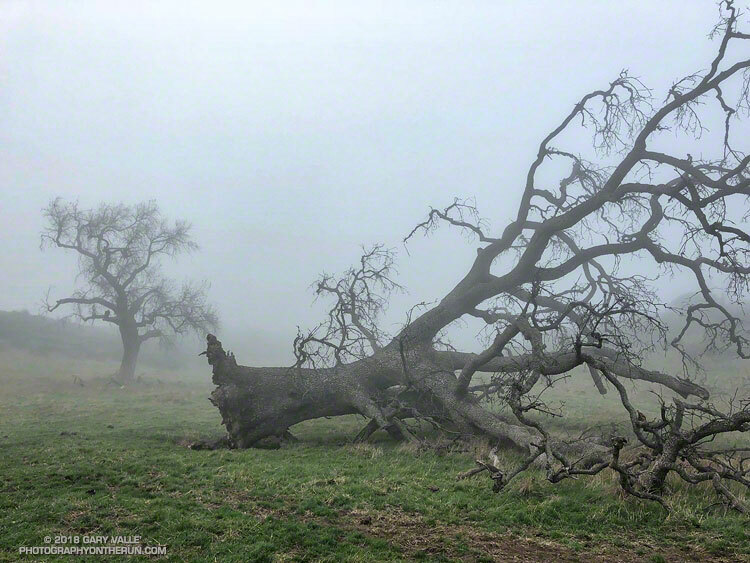 Photos of the fallen tree are from this morning’s foggy run along Rocky Peak fire road. 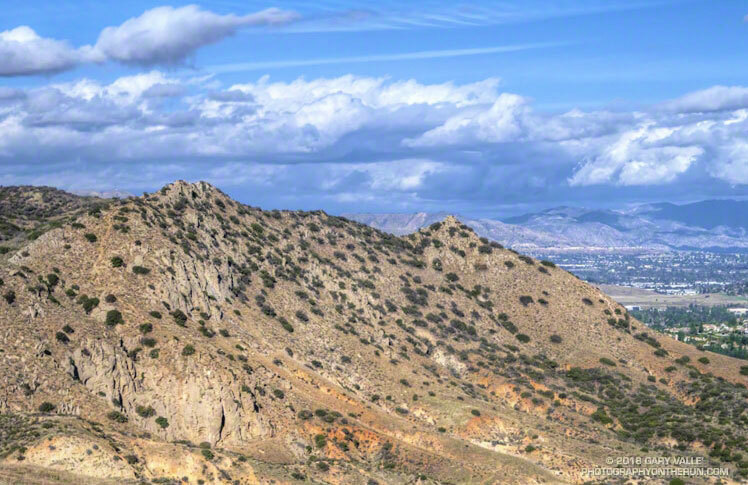 The Cave of Munits and Castle Peak are in the west San Fernando Valley, near the Los Angeles – Ventura County border. The mouth of the cave is at the base of the peak on the left and Castle Peak (Kas’élewun) is at the end of the ridge on the right. 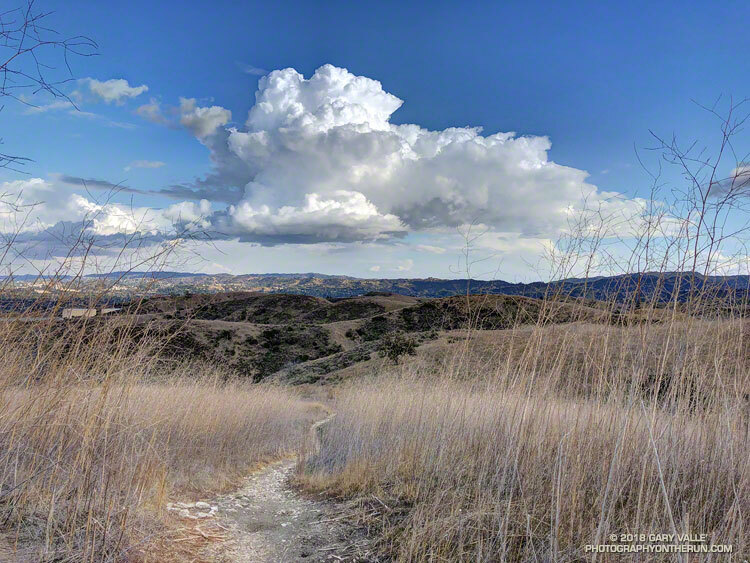 Images taken on trail runs, and other adventures, in the Open Space and Wilderness areas of California, and beyond. All content, including photography, is Copyright © 2006-2019 Gary Valle. All Rights Reserved.